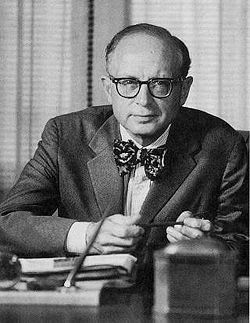 Daniel Boorstin (1914-2004), pictured here, was a Pulitzer Prize winning historian, a professor at the University of Chicago for 25 years and director of the National Museum of History and Technology of the Smithsonian Institution. Boorstin had more than fifty honorary degrees, and he was decorated by the governments of Japan, Portugal, Belgium and France. For about one year while a student, Boorstin was a member of the Communist Party. He has been described as a conservative but hostile toward the House Committee on Un-American Activities. Boorstin's The Seekers, is the last of Boorstin's twenty books and part of a trilogy that includes The Discoverers and The Creators. The Discoverers has been described as about science, The Creators about art. So what are "the Seekers" seeking? On the book's dust jacket, the columnist George Will writes: "He now turns to the great figures in history who sought meaning and purpose in our existence." I) The Way of the Prophets: a Higher Authority. Boorstin describes seer as different from a prophet of the Old Testament: "But seers, mere forecasters, came to be displaced by prophets, touched by the divinity for whom they spoke." This is not history or good anthropology. It's a religious sermon. He adds more as if it were established fact: "Then the prophets assumed a role beyond the community where they lived to whom God had first addressed His message." II) The Way of Philosophers: a Wondrous Instrument Within. Boorstin's chapter title: "Socrates' Discovery of Ignorance." My reading of Socrates leaves Boorstin's statement ludicrous. Socrates argued with questions, what today is called the Socratic method, and he did so pretending ignorance. Perhaps we can say he was a master at cross-examination and irony. What we gather from all that has been written about him, he thought that he knew a lot. He took oracles seriously. He believed that the universe was guided by a god with a sense of purpose, a God that was mind and a god that was the source of human consciousness and morality. Socrates, according to Plato, faulted Anaxgoras' nous, or god, as dead mechanics rather than a power with knowledge and design. According to Xenophon, Socrates called people fools for studying the mechanics of nature – the wind, rain, physics. Nature, Socrates believed, was part of the divine and one could approach the divine only through a sufficient knowledge of the human mind. The study of natural phenomena, Socrates believed, produced nothing practical. Boorstin, it seems to me, presents a distorted view of Socrates. III) The Christian Way: Experiments in Community. (IV) Way of Discovery: in Search of Experience. VI) The Momentum of History: Ways of Social Science. On history and the faulty certainties of 19th century pretenses at social science I'd rather turn to Joyce Appleby, Lynn Hunt and Margaret Jacob. Boorstin writes about "Seekers" escaping from dogmas, including what he calls the dogma of science. One such escapee he describes as Soren Kierkegaard, a man possessed by dogma as a matter of choice. Kirkegaard was opposed to philosophical constructs but an early proponent of what is called existentialism. Boorstin describes Nietzsche and Sartre as "creative disciples" of Kirkegaard. This is a distortion. Boorstin at this point in his book is romanticizing about Seeking rather than approving the views of those he is describing. Some sentences are factual. But much of it is babble. There is nothing here that differentiates between the certainties of Kirkegaard's choices and the uncertain hypothesizing that is supposed to be what we call the scientific method. VIII) A World in Process: the Meaning in Seeking. In my opinion we all seek. Hitler was a reader who sought and grabbed onto what he thought were truths. Some of us are better at it than others, perhaps you better than I. Some of us wander around in the dark, our match giving off a little light momentarily then burning out. Boorstin finds meaning in Seeking. I do too. Discovering is a pleasure. But Boorstin in his The Seekers romanticized it too much. I've read his The Discoverers and found a lot of good stuff in it, factual and in places insightful. Writing history is work, and Boorstin did a lot of work, for which he deserves credit. But from what I've read in this book I think that Boorstin, with his fifty honorary degrees, was over-rated. His The Creators I'm not going to look at. My grasp of art history is miniscule. I prefer the world of economics, power and politics, but for insights on art I would not trust Boorstin and would look to others, Sister Wendy Beckett among them.